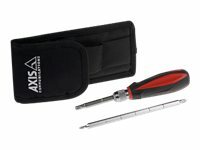 Axis 4-in-1 security screwdriver kit is a great tool for installing Axis products. The kit features two double-sided insert bits type that match Axis products using standard philips head. The insert bits material are made of stainless steel and chrome vanadium.